Crafting Queen: Stylish Blog Award! In the middle of the maddening House shifting i have been going through last 3-4 days now i just took out some time to peep into whats up in Blogville! And guess what i find an Award!! Yipee!! 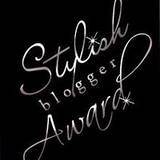 I received the Stylish Blog award from dear Rachana and Kavi. Wow 2 people think i deserved it. Thats So kewl. First 8 things about me! 4. I love travelling and exploring new places. I wish to travel to a new place, city, continent every year! 6. I hope one day i can adopt a dog or maybe 2. I love animals and so i have satisfied myself with 2 misbehaving guinea pigs. 7. I enjoy learning new things and discovering new ideas. I try and incorporate all the good in my daily life. 8. My DH is my true best friend and i wouldn't be writing on Blog hadn't he encouraged me to take Quilling seriously and create this Blog for me. I love him the most!